Seeking well-deserved rest and relaxation, Mario™ and Princess Peach travel to a beautiful remote island. It is said the local citizens are friendly and the weather forecast suggests year-round sunshine. However, when they get to the island, they quickly find out that the peaceful paradise has been polluted by a mysterious stranger. Worse still, the individual bears a striking resemblance to Mario! Determined to clear his reputation and clean up the island, Mario sets off on his greatest adventure yet. 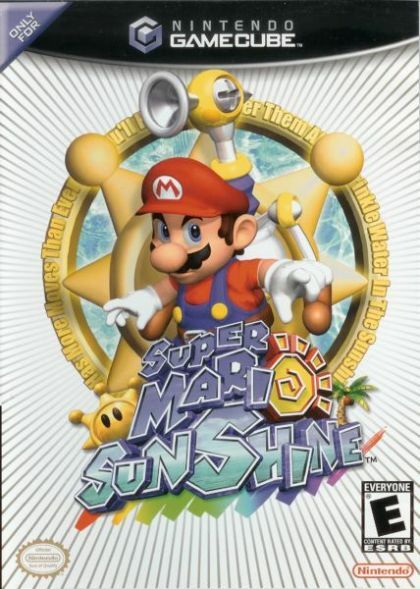 Discover the first Mario title for NINTENDO GAMECUBE, developed by a team under the supervision of Mario's celebrated creator Shigeru Miyamoto. Explore the game's colorful 3-D world, filled with expansive environments. Restore the power of Shine to keep the island clean. Wash away island mess to restore the community to its pristine condition using Mario's new water pump device. Perform a number of different jumps, bounce off walls, run, slide, climb, and fly to the highest reaches - more mobility than ever before. Bask in cheery graphics, real-time lighting effects and stunning reflections that bathe the island in sunshine. Visit Yoshi, Toad and a host of other friends as Mario encounters a collection of enemies bent on foiling his efforts to restore the island.